American Red Cross first aid, CPR and AED programs are designed to give you the confidence to respond in an emergency situation with skills that can save a life. Additional training in bloodborne pathogens, oxygen administration and injury prevention can be added to CPR and first aid training to prepare you to prevent and respond to life-threatening emergencies. 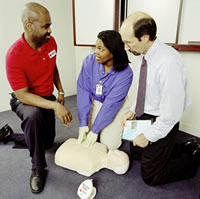 Red Cross Preparedness programs in first aid, CPR and AED are available for any age and can be tailored to the needs of specific groups and individuals. Whether you work with children, want training for employees, are a professional rescuer, or simply want to know how to help someone in an emergency, the American Red Cross has a program for you. Come to the Brownie's for American Red Cross training and tips on how to be safe in, on, and around the water! The American Red Cross has been the leader in swimming and lifeguarding since 1914. Now the winning tradition continues with an exciting new collection of courses designed to make learning easier and to help you benefit from the latest research on instructional techniques. Are you 15 or older and looking for a great summer job or a challenging career? American Red Cross Lifeguarding is the best place to start! Lifeguarding puts you in an exciting position, working as part of a team to help people safely enjoy the water. Read about Red Cross-trained lifeguards who have saved the lives of others. You could save a life too! Lifeguarding will help you develop skills and experience that will be valued by colleges and future employers. It's a great way to demonstrate what you can offer. Colleges and employers look for applicants who can deal effectively with people, who have a take charge attitude and who are willing to work to develop new skills. Find out how you can secure a lifeguarding job. This course was designed to give individuals the knowledge and skills necessary to provide care to a victim of a breathing emergency using breathing devices, including suction devices, oral and nasal airways, resuscitation masks, bag-valve mak resuscitators and supplemental oxygen. Attendees must possess a CURRENT American Red Cross Adult CPR certificate or equivalent that has been issued within one year of course completion. Certification Received: Oxygen Administration for the Professional Rescuer (valid for one year).